As I was cleaning my laptop this morning, I found this picture that brought me to tears. They were happy but yet sad tears. This is a picture of my 2 boys just a little over 3 years ago. The picture shows how loving my firstborn was to my newborn -- but behind this picture, he was mostly in an emotional turmoil. That was the sad part of this memory. 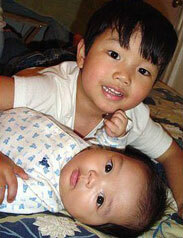 No sibling classes or any parental guidance could've prepared him more when his new little brother was born. Just when my husband and I thought we had him all ready for the addition in the family (God knows how much preparation we went through so he could feel as part of the new venture), he turned out to be the complete opposite. My firstborn did everything to show us how much he hated the new situation. He would shout at the baby, and even said “Go back to Mama’s tummy now”. I caught him taking away the baby blanket and hiding it away. He hated the idea that he has a brother. And every single time I got up to breastfeed in the wee hours of the night, he was up and throws a tantrum and asking for anything he can get me away from the baby. My husband and I cried so much. We were such an emotional bunch. We felt his pain, but he had to learn that there is someone new in our lives. My awesome husband attended to the new baby at night, so then my firstborn can feel secure that Mama will always love him, no matter what. Eventually, he learned to love his brother. Now they are inseparable. At most times they gang up on me. Hehe. Last night they both refuse to sleep in their own separate beds. They both decided to read their last book together, and giggled through their silly stories until they both fell asleep. As soon as it got quiet I checked in their room and they fell asleep in a sweet embrace. I seem to have done something right. With the 3rd baby on the way, I am pretty sure both my boys are ready for a new one. But they are both quick to add that “it better be a boy”. Haha. I think I’m going to have to grow a whole basketball team. How cute. I always wanted my own basket ball team. I thought it would be fun if you could play ball with your own family! Glad they are getting along now. I'm sure they will love the new baby just as much as they love each other. awww what a sweet but very scary story!!! I am so hoping our daughter does not hate this baby!! At least things turned around ... maybe a little roughness at first would be ok if it ended out ok...oh my I am all nervous now!!! It's so strange to me to think of #1 that way! By the time we visited, he seemed to be totally OK with #2, and I suppose that's what really matters, right? Danielle is going to be facing a similar situation soon . . .
Our first born seemed okay when her sister arrived but she regressed quite a bit. Potty training out the window, staying in bed gone, eating with utensils, not anymore. Now that they are older they have gotten better. They do grow out of it but boy sometimes they don't make it easy. What a sweet tale of how far your firstborn has come. It says alot about you and your husband and how much you have given for children. KUDOS to you both. And hey about #3 on the way...I'll vote for a girl if you'd like me to. A basketball team always needs at least one cheerleader right? My first two are seven years apart (because of fertility issues), but Matthew and Natalie are about 3 years apart. They fight like crazy, but if anyone tries to pick on her, he's always there to defend her....wholeheartedly. I always wanted that growing up but didn't have it, so I'm glad they have each other. The photo of your boys is adorable! ~crissy - My first one did get used to the new one after a couple of months. If I remember, I think you met them when they were a little bit bigger already so they are ok then. ~mama of 2 - thanks. A cheerleader would be nice to have, but really just route for an extremely healthy and sound baby whether it is a girl or a boy. Oh sweetness!I hope my kiddies will be like them,too. aw.....ours are nearly 4 years apart, which makes the eldest more understanding. both boys too...but then in our family, we've decided that the kids shouldn't outnumber the parents. hahahahaha!